Have you ever worked and plodded along on one of your dreams, but didn’t’ know when you’d catch your break? DJ McKenzie has. He has been working on a master’s degree in Learning and Technology the last two years. Combine that with seven years as the IT guy and Computer science teacher; he is now ready to kick the computer science program at Madison Academy up a notch. After lots of studying and planning he’s created a new four-year computer science curriculum that will allow students to become well-versed in computing, programming, and robotics. That’s not even the coolest part. McKenzie and Mrs. VP worked on a grant in November for this program. It was a long shot to get it, but in March they received word that the computer science program would be awarded $10,000. 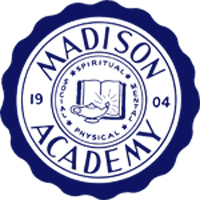 This grant will allow Madison Academy to start purchasing the material they need to upgrade some of the computers and buy the equipment they need to begin the robotics program. We are still looking for partners to invest in this program. Our program goal is $18,000 to fund the computer science upgrade for next year. There are many elements that we still need. If you want to be part of this game-changing program, please contact Taleah Valles-Peters. Together, with DJ McKenzie, we can share how you can make a significant impact on Madison Academy.